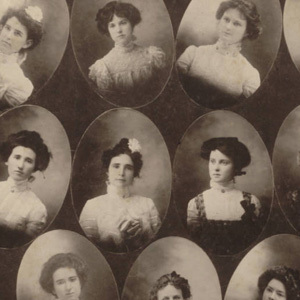 Late 19th and early 20th century photographic images of Due West Female College students and campus life. The DWFC opened in 1859 and was funded by a joint share-holding company, men mostly associated with the Associate Reformed Presbyterian Church. The purpose was to give young women equal educational advantages with young men and to provide those of the church and the community an adequate education under Christian influences and environment. The DWFC operated in conjunction with the all-male Erskine College until 1904, when it became the Woman’s College of Due West.